How much is Marc Marquez Worth? Marc Marquez net worth: Marc Marquez is a Spanish motorcycle racer who has a net worth of $25 million. Marc Marquez was born in Cervera, Spain in February 1993. He is a Grand Prix motorcycle road racer who has won six Grand Prix championships making him one of the most successful racers of all time. He debuted for Honda's factory team in 2013 in MotoGP. 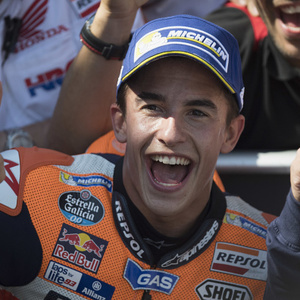 Marquez is one of only four riders who have won world championships in three different categories. His accomplishments include the 2010 125cc World Championship, the 2012 Moto2 World Championship, and the MotoGP World Championships in 2013, 2014, 2016, and 2017. He became the youngest rider and the first since 1978 to accomplish the premier class title during his first season. Marc Marquez had a great season in 2014 when he won 10 races in a row and easily defended his title. In 2016 he tied the all-time Grand Prix record for pole positions at just 23 years old. Marc is the older brother of Alex Marquez who won the Moto3 world championship in 2014.